Nervous constitution or Anxiety disorder? How much nervousness does it take to get diagnosed with an anxiety disorder? Some people are just nervous by nature. Anxiety disorders are the most commonly diagnosed mental or emotional illness in America and probably the rest of the world also. How much anxiety does it take to get you the label of having an anxiety disorder? Clearly, there are some extremely debilitating disorders whose main characteristic is anxiety. In Post-traumatic Stress Disorder (PTSD) some telltale symptoms are recurrent intrusive thoughts and efforts to avoid stimuli that remind you of the original trauma. Panic disorder results in anxiety produced physical symptoms that can be difficult for a trained physician to tell apart without lab work. Short of those extreme cases, there are a lot of people who have varying degrees of symptoms, less severe symptoms than what is seen in Panic attacks and PTSD but still very impairing to their quality of life. This makes me think of the days when most anyone who went to see a psychoanalyst got the label of Neurotic. If everyone is neurotic then does the label tell us anything about your problem and what you need to do to get better? I would not be willing to agree that everyone is sick and no one ever gets any better. While neurotic does not get diagnosed much anymore we seem to be slipping into an area where everyone gets a psychiatric diagnosis. One thing we were taught in graduate school was to be careful to not pathologize all our clients. That beginning student mistake of having learned about a new disease you begin to think that every client you see has something wrong with them. Keep this up long enough and the therapist starts thinking they have the illness also. Now look, I am not even sure that anxiety is a bad thing. Sometimes it is, when it gets out of control, but it can also be a good thing. Anxiety is supposed to warn you when you are in danger. If you live in a bad part of town, with lots of drive-by shootings, and you hear gunfire, I think it is a good idea to get anxious and duck behind something for protection. So a little bit of anxiety is good. Too much is bad. How can you tell if you have too much or too little? Too little anxiety probably is not a big problem in our society. If you fail to appreciate the danger and don’t duck, you get shot. Maybe you die. If you continually get into dangerous situations and get hurt, consider that you may have the volume turned down too low on your anxiety detector. That or you may be subconsciously trying to get hurt. So if you take excessive risks talk with someone about that. Preferably talk with a professional or become a daredevil and get an agent. What about those who are anxious all the time? Here are some things you need to consider. Do others around you feel the same anxiety? Just because going to the mall terrifies you, does not in all likelihood mean that your particular mall is life-threatening. 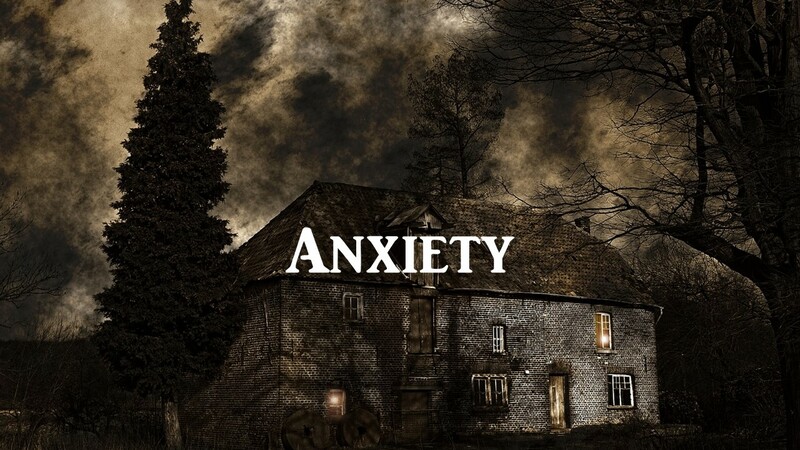 If you have high levels of anxiety in situations where your friends, family or people you trust have no problem, then you may have excess anxiety. If that excess anxiety begins to keep you home from work, we call that interfering with occupational functioning, then it is a problem. If it interferes with your social function, keeps you from being with or doing things with family and friends then it is excessive. So anytime a mental health symptom interferes with family, friends or your job, and school counts as a job, you need help. If this anxiety is bothering you, we call that subjective distress, you should also get help. Consider also what age you were when you began to experience the anxiety. Children can have more anxiety than adults. They don’t know what should scare them and what should not. Our fairy tales and media entertainment can scare them, also. They are likely to be scared of strangers and going to school these days despite the fact that they are far more likely to be molested by a family member than a stranger. They are also more likely, here in the United States to be shot at home by their parent than to be injured by someone with a gun while at school. Keeping guns out of schools and avoiding strangers are two more fairy tales we tell our children to make ourselves feel safer. Providing more mental health treatment for people with anger issues and other mental illnesses is too logical a solution to ever become popular with most politicians. Sermon over – back to post on anxiety. People who develop severe, life-impairing, anxiety in their adult years frequently had excess anxiety in childhood. If you remember having excess anxiety, being scared all the time as a child and did not grow out of it, you should especially consider getting help for this issue. If your child has excess anxiety and does not seem to be growing out of it, then the sooner they get help from family, friends or professionals the less likely they are to have to struggle with an anxiety disorder the rest of their life. Additionally, if your anxiety has a basis in a real trauma, you were raped, molested, abused or experienced a traumatic event, and this anxiety is not fading as time goes on, you need to seek help for the skills you need to cope with life. Look for a counselor that wants to help you heal from the pain and is able and willing to hear whatever you need to tell without them having the compulsion to cut you open and dig out every detail of every trauma you may have experienced. What has been your experience with a nervous constitution, an Anxiety Disorder, PTSD or panic disorder or any other fear based problem? This entry was posted in Anxiety, Emotions and Feelings, PTSD & Stress, Trauma- and Stressor-Related Disorders and tagged Anxiety, Anxiety disorder, Emotions and feelings, Licensed Therapist & Licensed Counselor, Nervousness, Neurosis, Panic Attach or Panic Disorder, Post-traumatic Stress Disorder (PTSD) by David Joel Miller. Bookmark the permalink.